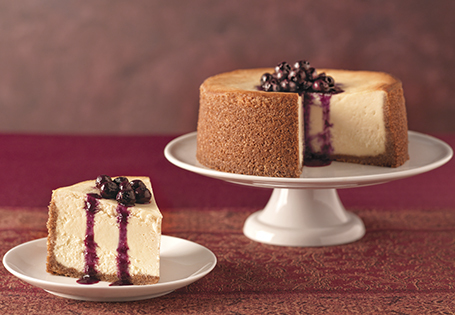 A sweet, bold and earthy cheesecake topped with a blueberry sauce. For the crust: Preheat oven to 350°. On a baking sheet, toast the pecans and almonds for 10 minutes. In a food processor, pulse the pecans, almonds and graham crackers into coarse crumbs. In a large bowl, combine the crumb mixture, melted butter, sugar and salt. Stir until well combined. Press into the bottom and sides of an 8-inch springform pan. For the cheesecake filling: Using a mixer, cream the goat cheese and the sugar together. Add the sour cream, vanilla and flour. Cream until well combined. Pour into the crust. Bake for 1 hour or until set. Turn off the heat, leave the cheesecake in the oven for 30 minutes before refrigerating. Serve chilled. For the sauce: In a small saucepan, combine the blueberries and sugar. Bring to a simmer, simmer for 10 minutes until sauce has thickened. Chill, serve with cheesecake.